Lets talk about Drawing for Kids – Kids like to Draw! They start scribbling at around 18 months and don’t really care too much about the final product – the process of drawing and seeing marks appear on the page is enough for them to get hooked. Later most will begin to use shapes and color selection to represent objects and people. I still have some of Lucas’s early drawings, and you can see genuine attempts to represent characters from Thomas and Friends. 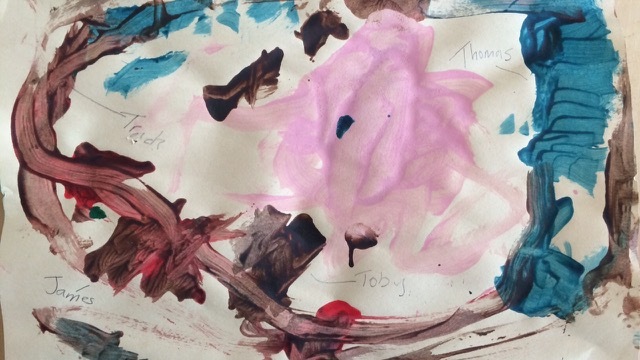 I use the word ‘genuine attempt’ because often I would challenge him to draw a character, but sometimes our little ones might just be drawing at random, and only recognize meaning to their creation ‘after’ it appears in front of them. What I found is that it’s important to ask questions about their work and engage them in dialogue. ‘What’s this?’ or ‘Who do we know who is this color?’ are nice simple questions to get the conversation started with little ones. I can’t remember Lucas’s age, but I made a note of what he said each item was. You can see clearly that he uses color to distinguish between shapes. I’ve been really interested in how drawing has played into Lucas’s creative development. His imagination regularly plays out on the page and one of his favorite activities continues to be making stories. My wife sometimes shows him YouTube videos of how to draw an animal and I have found some cool drawing apps from the Apple App Store. One of my favorites is the Mastermind Kit from OSMO, which combines technology with traditional drawing styles on paper. This is important as Lucas is not a fan of drawing on the iPad itself and likes the feel (or perhaps freedom) of a pencil and paper. Observing Lucas I feel there are two parallels in play – one is the creation of a story and the other is the development of drawing skills. 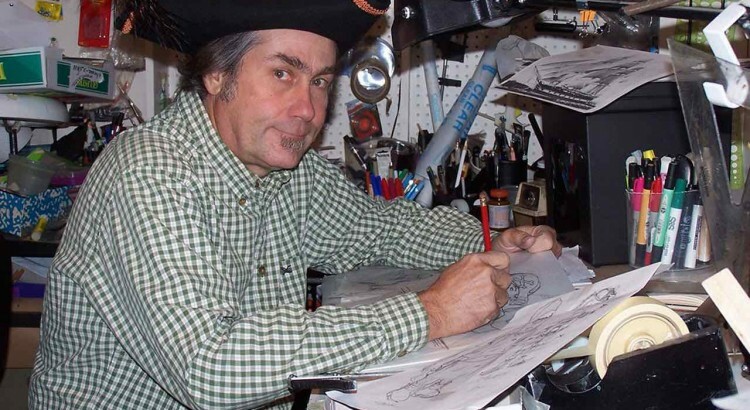 Last month I pumped into Artist and Illustrator Bill Dougal, who has over thirty years of experience as a professional artist, specializing in Caricature Drawing and Advertising for children’s books. I asked Bill to provide some advice on how parents might better cultivate drawing skills in our little ones. Why do you think most children like to draw? For example, my boy loves to act out stories on paper. I’ve introduced him to some great apps on the iPad, but he keeps coming back to the crayon. How does the act of drawing engage Creative Thinking Skills in children? More importantly, is there a way to expand upon these skills? Once you draw a line, you have to think how the next one should be. Options include placement, size, shape, style etc. Are their any drawing techniques or styles that you think parents can introduce to their children at an early age? Picture making skills can be advanced if the child understands the process. Steps include; idea, planning drawing, assessment, chances, and finishing. This may be advanced for the very young. A simpler version is; Draw something, think how it can be better, then draw it again. Tots can explore examples of variety. For instance, different kinds of lines, i.e. scribbly, jaggedy, dashed etc. They could also try different kinds of compositions, i.e. sparse, busy, or weighted to various areas of the paper.